I will have a much longer and detailed post on this in the future, with new projections, but this breaking news (at least as far as it comes with dry demographic statistics) so I can’t refrain from writing a preliminary post on the matter. For all intents and purposes, Russia’s demographic crisis – the infamous “death spiral” afflicting it for much of the post-Soviet period – is at an end. 1. The population increased by 189,000. The rate of natural decrease, deaths minus births, is now at a mere 131,000; for comparison, it was consistently within the 700,000 to 1,000,000 range from 1993 to 2006. This was more than balanced by an uptick in net immigration, which rose to 320,000 this year. (This has not stopped the hackish Western media from slobbering on about Russia’s “brain drain” at just the precise moment in time that it finally came to a complete halt). 2. Births continue to rise, with Total Fertility Rates reaching 1.57 in 2010 and 1.60 in 2011. This is marginally higher than the EU average (1.59 in 2009), and similar to Canada (1.67 in 2009) and to Estonia (1.62 in 2009), which was the majority-Christian nation least affected by the demographic crisis after the Soviet collapse. Life expectancy is still dismal by industrialized country standards but is immeasurably better than before, having increased to 70.3 years in 2011. 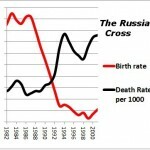 Russians have never lived longer; the previous two peaks were in 1964, at 69.9 years, and in 1986-87, at 70.0 years. 3. The structure of mortality has improved a lot, with fewer Russians dying from external causes (the bulk of which, in its case, are caused by drunkenness). Suicides, homicides, and deaths from alcohol poisoning are all now below the levels of 1990, the last year of Soviet “normality.” They are still far above the levels they should be but I am confident they will continue to improve as the effects of excise taxes and regulations causes alcohol culture to transform into the more reasonable forms seen in the US and Western Europe. 4. Because the immigrant population was previously under-counted, the most recent Census revealed the population to be 142.9 million as opposed to the projected 141.9 million. With the growth this year, it is now at 143.0 million. 4. Let me take the opportunity to remind the reader that I predicted this all. Hardly anyone else did. Back in mid 2008 I wrote: “Russia will see positive population growth starting from 2010 at the latest” (back when all the agencies and Big Name Experts were expecting unrelenting decline). I was 100% correct. The population was already growing by 23,000 in 2009. It did dip by 48,000 in 2010, but this was due to the chaotic effect of the heatwave and an unexpected decline in net immigration; this year, it more than made up the difference by growing for 2010 (and even 2008). My models were if anything too conservative on life expectancy. Even the most optimistic only broke the (unprecedented) 70 years barrier by 2012-13, but as of 2011 it was already at 70.3 as mentioned above. (A) The purpose of this post is primarily to avail readers of the latest developments, which have barely even been covered by the Russian media let alone the likes of Eberstadt. (B) This effect is implicitly addressed in my models. I’m not going to argue with you on this until or unless you first read this post (which describes my models) and this discussion.